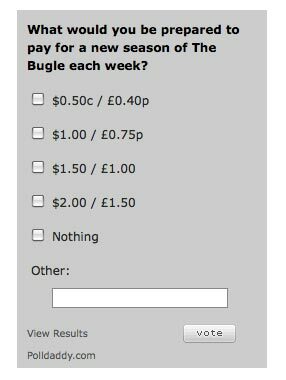 Interesting poll currently running (well, at 2:54pm on July 24 at least) on Times Online asking if and how much listeners would be willing to pay to listen to its podcast The Bugle. Of course this means nothing more than the podcast’s producer’s curiosity over whether its audience would be willing to pay. So far, 41 per cent of respondents have suggested they would pay something; though 59 per cent say they wouldn’t cough up at all. It’s also quite refreshing to see a newspaper site ask its users outright – whether this means there are any plans to charge or not. According to a Bloomberg report today, Jonathan Miller, chief digital officer with News Corp, whose News International arm owns the Times, has suggested the group could start charging for news and entertainment online. Back in June, MediaGuardian reports suggested the Times’ sister title, the Sunday Times, was considering setting up a paid-for standalone webiste. This entry was posted in Online Journalism and tagged Bloomberg, chief digital officer, Jonathan Miller, News Corp, News International, newspaper site, Online asking, Online poll Interesting poll, pay walls, paywall, paywalls, podcasting, producer, Sunday Times, the bugle, the Sunday Times, The Times, Times Online on July 24, 2009 by Laura Oliver.